The purpose of this post is to serve as something of a catch-all how-to for hosting multiple domains with Apache 2 on a single IP with SSL enabled for all of them. I recently underwent this process with every domain I have a website behind, and doing it correctly required information from a lot of different sources. Enabling SNI support in Apache 2.2 is very simple. Add this line to your conf file (you will probably already have a similar line for regular HTTP connections on port 80). This is no longer necessary on Apache 2.4 as it is automatically enabled when any address/port combination appears in multiple virtual hosts2. Any SSL certificate signed by an accepted CA will work. It does not need to be anything special like a UCC certificate (these cover multiple domains in a single certificate) or an EV certificate. 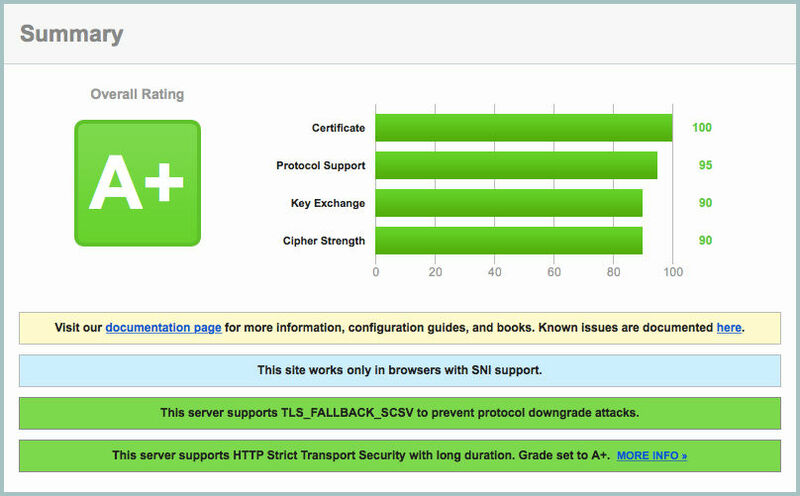 The free certificates issued by a service such as StartSSL are sufficient. Each domain you want to have SSL enabled for must be named in a certificate, whether they each have one or share one. # Header always set Strict-Transport-Security "max-age=15552000; includeSubDomains"
Lastly, enter your site’s address into the SSL Labs tester to verify your configuration is secure.